On the chopping block. 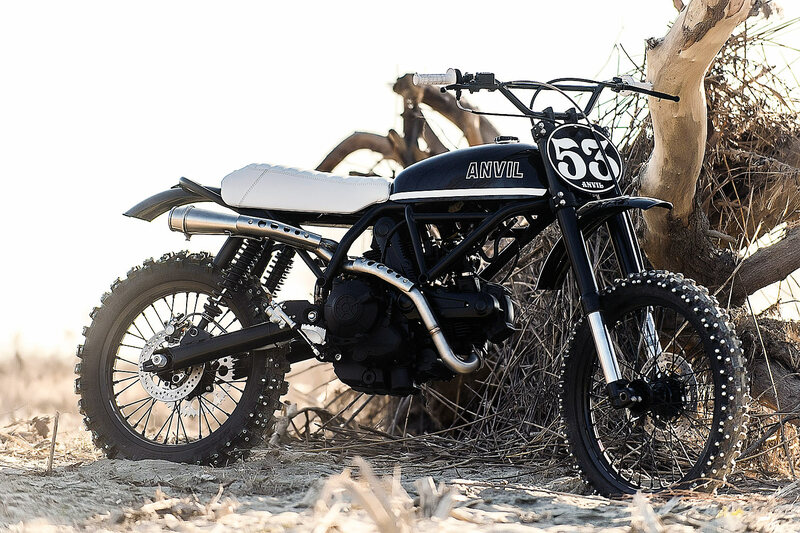 Coolest Ducati Scrambler ever? So why pick San Marco and Phonz of Anvil for such a build, they’re neither conventional in their style nor fond of rules. A risk for a large multi-national, until you think back to your childhood and that one certain memory. 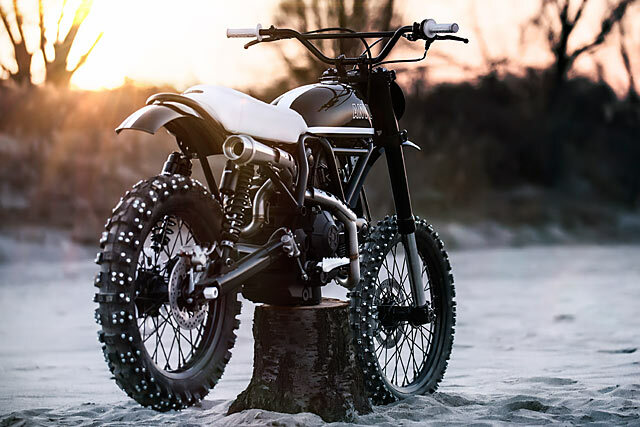 Sitting aboard your BMX or Mountain bike, gazing down a steep hill in a chewed up paddock (field), with knee high grass hiding all kinds of deadly obstacles. Your parents told you to wear your helmet and stay where you could see them. But having slipped away you looked down that big hill and thought screw it, took the plunge and peddled as fast as you could. Some days you survived, others you went over the handlebars and missed a few weeks of school with a broken arm. But you loved every thrilling second. With Ducati providing the new bike it was quickly up on the workshop lift for the engine to be pulled. Why? 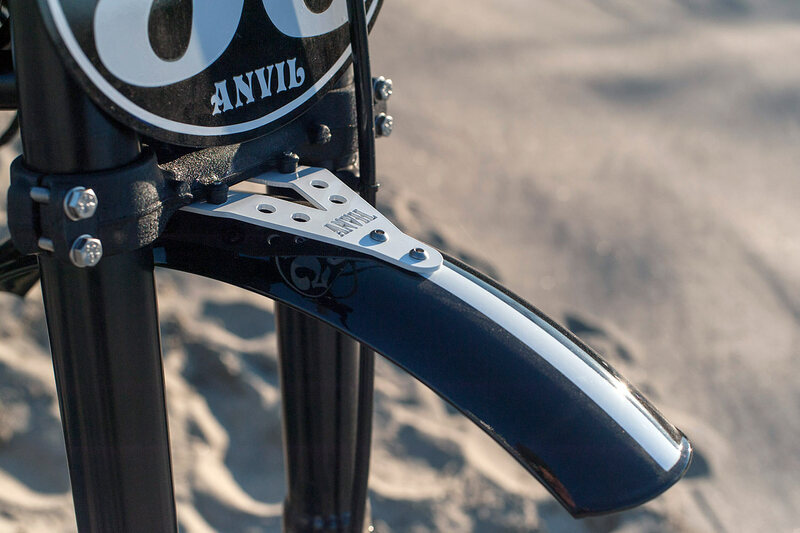 Because nothing says Anvil like taking a brand new bike and cutting the frame in half! 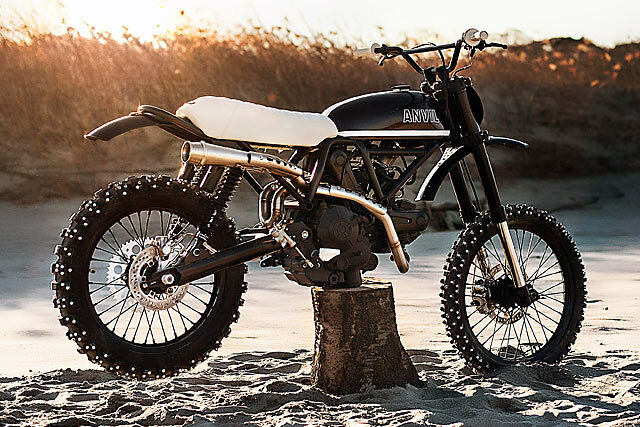 They only wanted the front section anyway and the rest would be re-modelled taking its cues from the original Scramblers. 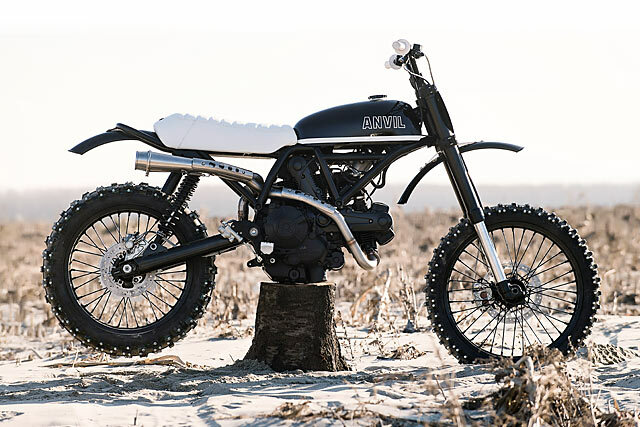 “We wanted to pay tribute to this brilliant glory of Ducati reinterpreting the old in modern clothes, as if the world of modern motocross had a crush, bringing certain stylistic quirks used in the ’70s.” The first of those old additions comes in the way of the all new subframe that seamlessly extends off the factory piece and moves rearward creating an oversized hooped rear. The work on the frame was carefully carried out so that the changes looked stock while also retaining total engineering integrity. The new rear hoop hangs a classic hand rolled rear fender to catch all the debris the heavily treaded tyres can throw its way. The front unit is equally generous, with a beautifully machined bracket featuring the Anvil name holding it in place. Back on the rear subframe Anvil went outside of their usual black on black design for a taste of “70s American Stuntman”. 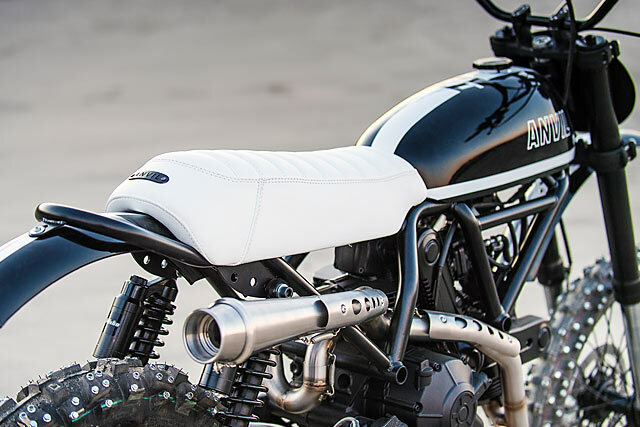 The white leather seat also paying homage to the Scramblers shape of old with plenty of Yankee flair. But to really capture the look and feel of times gone by the plastic fantastic look of the modern machines fuel tank would have to go. Anvil then crafted a piece that had to do three things; form the lines of the original, fit the modern frame and hold the 21st century fuel injection components. 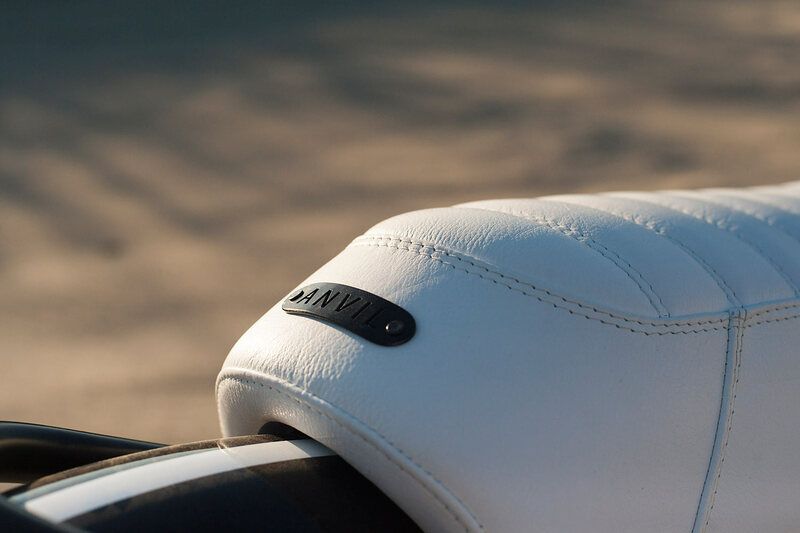 It’s a win on all counts with the slim lines, small capacity and old school crosser filler cap the perfect recreation. 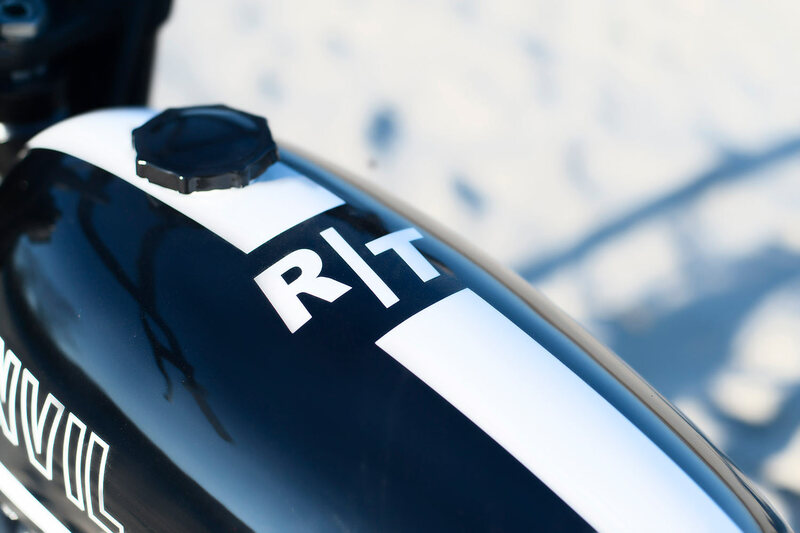 The paint returns to what we’ve come to know and love from Marco and Phonz, with the tank just the start of the black that covers almost the entire bike. 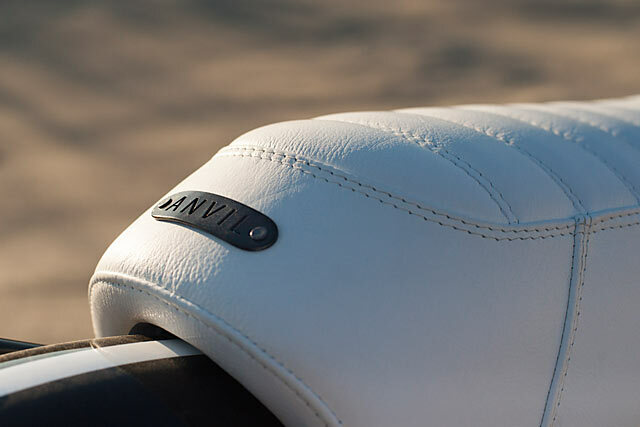 But a simple white graphic and Anvil logo means the seat is not left standing out from the crowd. To help take the bike back to its roots, much of the modern comforts and accessories have been stripped away. 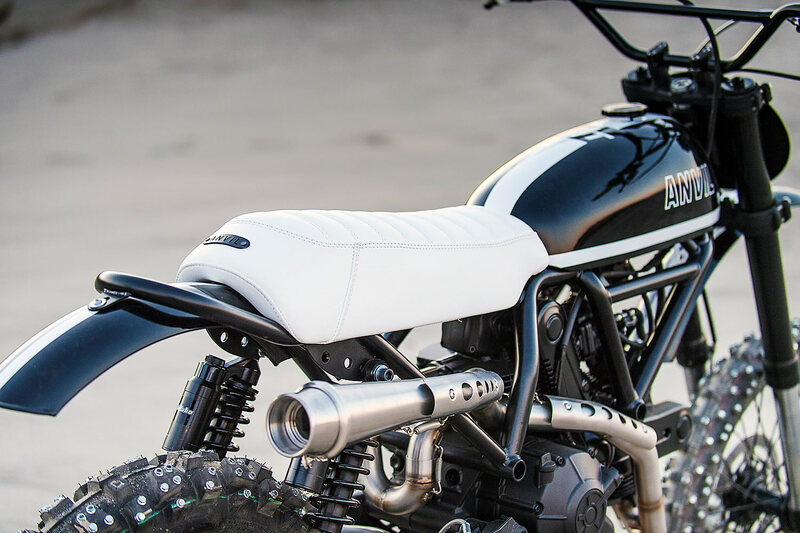 The switch blocks and fancy speedo gauge are gone, its minimalism and seat of your pants stuff in this Scrambler world. 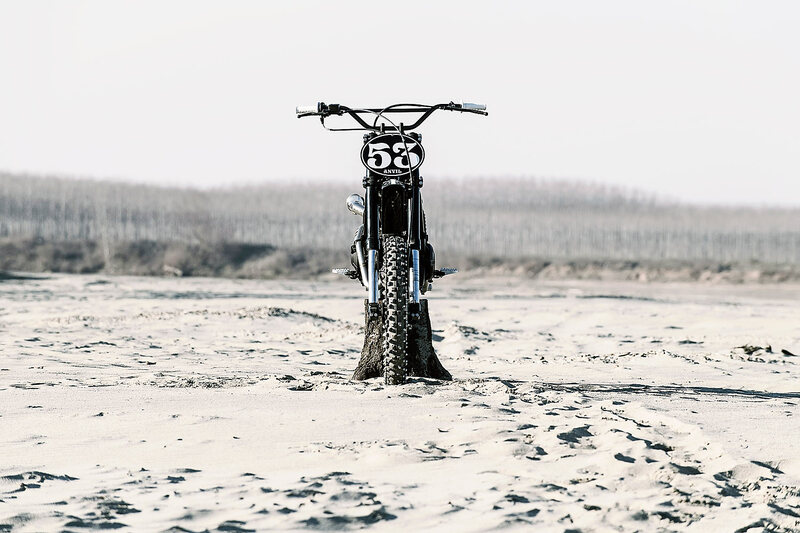 “The handlebar incorporates the classic forms of those used in the competitions in the American deserts” With a white set of Motocross grips and simplified levers for when you come close to a tree and need a handful of brake. All the standard braking system is replaced with a Brembo caliper and floating front disc, while in the back a drilled disc is grabbed by a solid mounted caliper. 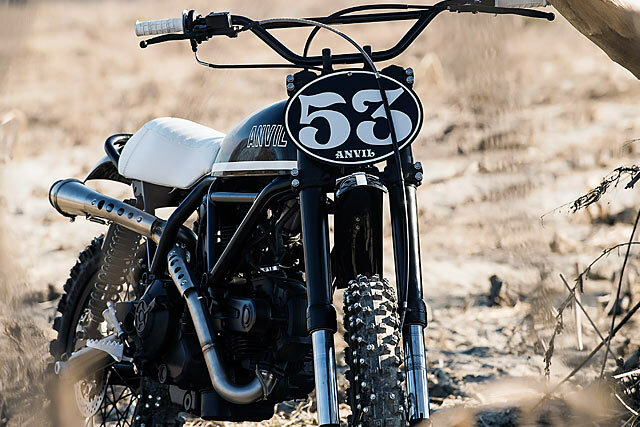 The engine might be just 399cc of total swept capacity but a short stroke of 49mm means it’ll rev harder than a cheap air-cooled twin has any right to do. Ducati’s refusal to go cheap on parts means the fuelling is crisp and the torque is always there. Perfect for ripping up back lanes or flinging mud, so to give it the matching look the boys gave it the Anvil all black treatment. To remove weight, the horrific stock exhaust, only there to pass Euro 4 compliance has been ditched. With Zard coming to the party with an all new hand crafted stainless system that is a modern interpretation of the ’70s style. But there’s no point having a great bark if the bike won’t bite into the ground when you ask it to. So the suspension has come in for a serious overhaul and you may not pick up all the features just by looking at the pictures. The front forks are Kayaba items that are modified internally to get the height and specs just right. 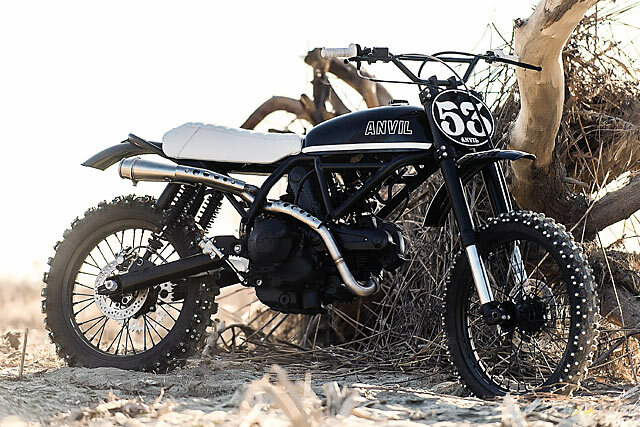 But the big changes came at the rear, the swingarm might look totally stock but it’s of Anvil’s own design. The boys are serious about their off-road riding and wanted the wheel travel to match. So with the help of Bitubo who built them a one-off set of long travel shocks, they matched them to the smooth and lengthy swingarm to create the perfect geometry. This had all been designed around the wheel and tyre combination they felt best matched the intended purpose of the bike. 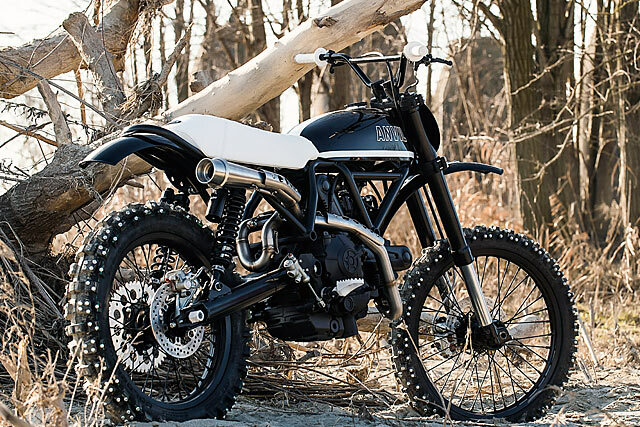 Sure you could slap a set of knobby tyres on the stock rims and call it an off-road machine, but you’d only be playing. 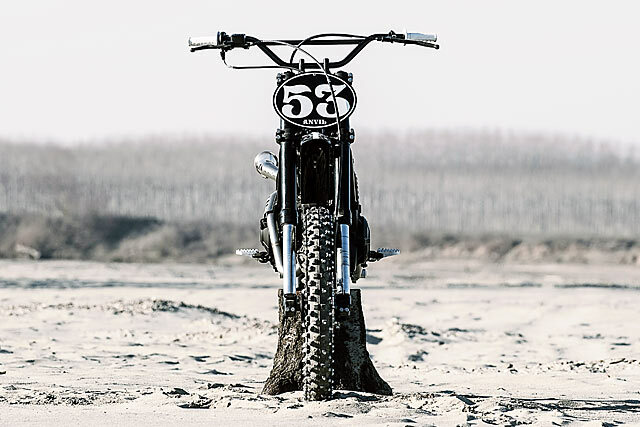 To do it right a modern set of, Motocross rims measuring 21 inches in the front and 19 inches in the rear have been chosen for the task. 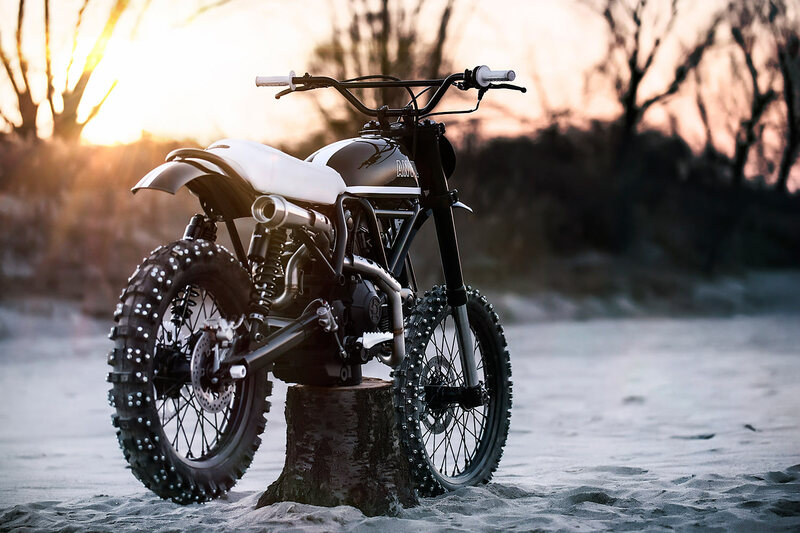 The new sizing opening up a world of tyre choice possibilities and those metal studs means this Scrambler will happily play in mud, sand and snow! To finish out the build the Scrambler finally gets the race plate it deserves wearing the number 53. A nod to the incredibly short number of days it took Marco and Phonz to complete the build. 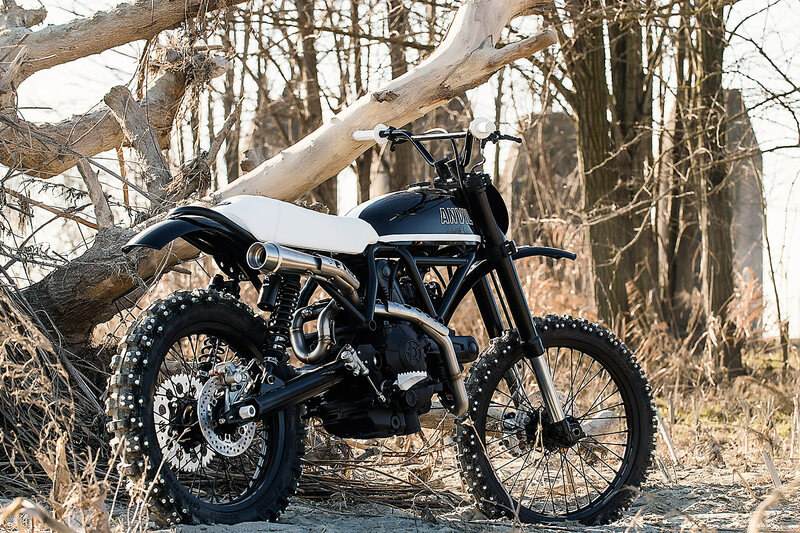 Ducati might have taken a risk in commissioning the two blacked out rock stars of the Italian custom scene. 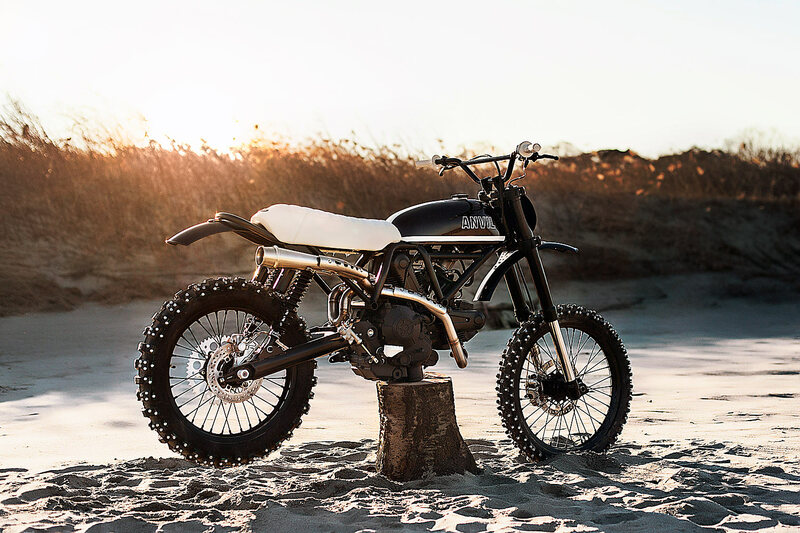 But they’ve been rewarded in spades with the Scrambler getting the sort of fit and finish that once took the ’70s version through 6 days of incredible slog at the 1971 Isle of Man Trials. But before it can return to its natural habitat and hurl a teenage hearted biker down the steepest of hill. 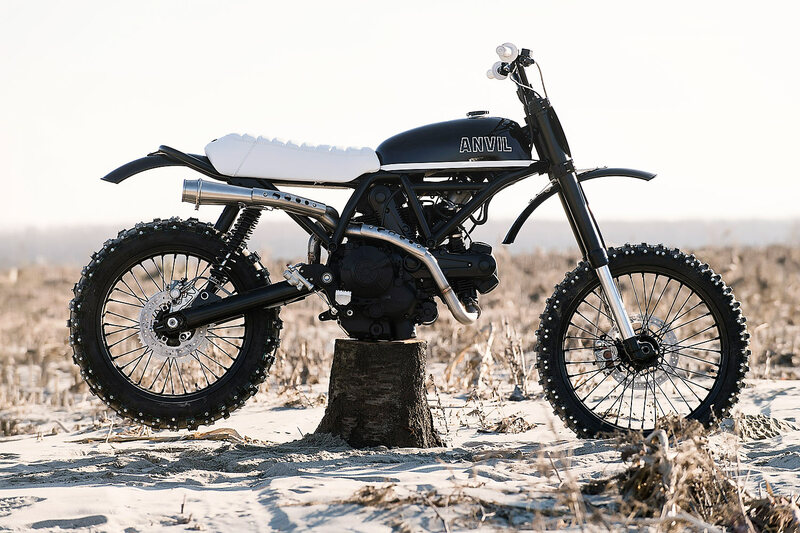 The Scrambler is off to the Wildays event in Parma after making its full debut at the MBE Show on the official Ducati stand. If you’re in the area, make sure you check it out.